Writer Meyer Levin in 1948 asked Garry Davis to "plant some seeds of world citizenship and world law" in the Holy Land. 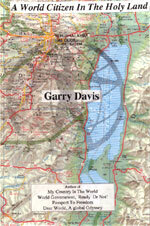 Dedicated to his brother Bud, who died in WWII, this timely journal is the story of Davis' spiritual peacemaking mission in that part of the world from where the prophecy of Armaggedon or Millenium derives. World Government, Ready or Not! Copyright (C) World Service Authority. All Rights Reserved.